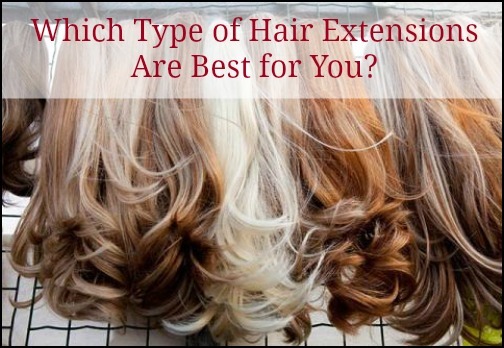 Types of Hair Extensions – Which Is Best for You? If you are interested in getting hair extensions to make your hair longer or fuller, you have quite a bit of options available to you. Choosing the best hair extensions for you may be overwhelming especially if you really aren’t sure which ones are even available for you. Learning more about each type of hair extensions can give you a better idea of which one may work for your hair style as well as for your budget. Before getting into each type of hair extension that is available the most important thing to first choose is whether or not you want to buy synthetic hair or spend more money for better quality human hair extensions. Synthetic hair extensions are made from chemical fine little fibers that resemble real hair. You will find that most synthetic hair extensions can’t be around heat like a curling iron as they may burn or melt. There are some more expensive synthetic hair extensions that will be chemically treated to allow for some heat but these are usually more expensive. On the other hand, real human hair extensions may be more expensive, but they are made from actual hair. They can be curled, straightened and styled just like your hair and they look a lot more realistic. Synthetic hair extensions definitely have their place though. If you are looking for something for just one night or even something funky and fun to use for a night out, synthetic extensions may be the best choice for you. You can find synthetic hair extensions at lots of different places from Sally’s Beauty Store to online at Amazon.com. Best of all they are really cheap and you can even find some for around $10-$15 depending on how much hair you want. If you are looking for real human hair extensions, here are the different types you can choose from. Clip in hair extensions are your basic extensions that you can buy yourself at the store or online. They can be made of real human hair as well as synthetic materials as well. They are super simple to put in your own hair as they just clip into the root of your hair. You can find videos online that will teach exactly how to clip them in for the best realistic appearance. There are all kinds of different clip on hair extensions that you can find from natural looking hair in brown, blonde, black, and red as well as other less natural colors like pink, purple, blue, and green. Clip in hair extensions make a great introduction to hair extensions and may be an option if you aren’t going to wear the extensions all the time or you just want to play around with different hair styles. You will find that most salons use some sort of fusion bonded or glue hair extensions. There are hot fusion hair extensions which are the most popular as well as cold fusion hair extensions. With hot fusion bonded hair extensions the stylist uses a hot glue product to attach the hair extensions to the root of your hair. This is done underneath the hair in places where you can’t tell the hair extensions as placed. Hot fusion extensions can last anywhere from 2-3 months in your hair. Cold fusion hair extensions are slightly different and actually more expensive. It is a newer technology that used a keratin based glue to attach the extensions to the root of your hair. This procedure is gentler on your hair and last longer. You will find that cold fusion hair extensions can last up to approximately 6 months but will cost you quite a bit more than hot fusion extensions. Another choice you have for a type of hair extensions are coil hair extensions. With these a tiny copper coil is used to string the hair extensions onto the root of your own hair. Some women like this method better than the fusion bonded extensions because it is gentler on your hair. If you are choosing coil hair extensions it is definitely recommended you find a good qualified hair stylist as it does take a professional to place the extensions so they look natural and you aren’t able to see where they are attached to your hair. Sewn in or braided hair extensions are often usually called weaves but are considered hair extensions. These types of hair extensions take much longer to put in as you have to actually sew them into the roots of your hair or they are braided right into the roots. You can get your whole head down with a weave or you can choose to just add a few hair extensions underneath to add some fullness to your hair style. You can actually buy these hair extensions yourself if you know someone who can put them in for you, but it is recommended that you find a professional hair stylist who can do properly so your hair looks as natural as possible. These hair extensions can last anywhere from 2-5 months depending on how fast your hair grows and well they were sewn into your hair. When deciding which hair extensions may be best for you and your hair, you consider the cost of the hair extensions as well as maintenance and the quality of the extensions. This will help you get the beautiful long and full hair you want with the best results. FAQ: Can You Feel Hair Extensions In Your Head?